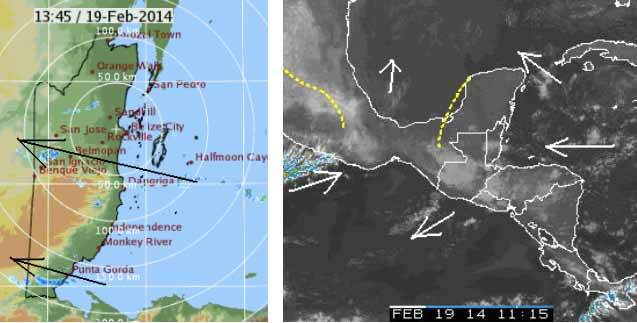 Belize NMS: Somewhat moist conditions exist, drier air mass sets in later today. 24-hour forecast: Cloudy spells today and partly cloudy skies tonight. A few showers will develop mainly over the south and along some coastal areaas this morning, shifting to inland areas this afternoon. Showers become isolated tonight. Today: Winds: East 10-20 kt. ; seas: Choppy-moderate; waves: 2-4 ft.; a few showers (morning mainly). Tomorrow: Winds: E/SE 10-20 kt. ; seas:Moderate. ; waves: 3-6 ft.; isolated showers. Marine Outlook: Winds: E/SE 10-20 kt. ; seas:Moderate. ; waves: 3-6 ft.; isolated showers. General Outlook: (Thursday): Partly cloudy with isolated showers. On Ambergris Caye this morning we have a wind from the East at 13 mph and the sea is a little choppy. The expected high is 84 and it's sunny. That Caribbean cloud area that moved in yesterday is not thinning, and the SW Pacific higher cloud that was overshooting Belize for much of yesterday is not evident this morning. . .. .Yesterdays rain was originally heading for Dangriga and the hills, but the wind direction changed, so much of it came over Belmopan. There are still scattered showers out there, so I expect a few more today, but not too much.. . . .The Sun will probably appear today, improving later this morning.